I just finished the dress and wish I could show it to you filled. But I can’t try it on her until her birthday on August 1st. Oh, how hard to wait!! I really like the way this turned out and hope you do, too. Would love to hear your comments. 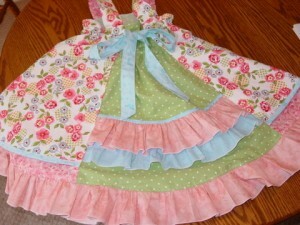 This dress is absolutely ADORABLE! 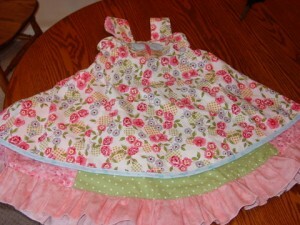 I would love to have the talent to make something like that for my granddaughter. Vicki, give it a try! You might be surprised that indeed you do have the talent to make it. If you have any questions about sewing Farbenmix’ or other patterns, let me know and I will try to help or others visiting here might be willing to help. Thanks for visiting and do come back. Thank You for your pictures and your techniques. I’m waiting for this pattern to come in the mail now. After seeing your beautiful dress, I can’t wait to try mine. Oh, I am so glad you are going to give this a try. 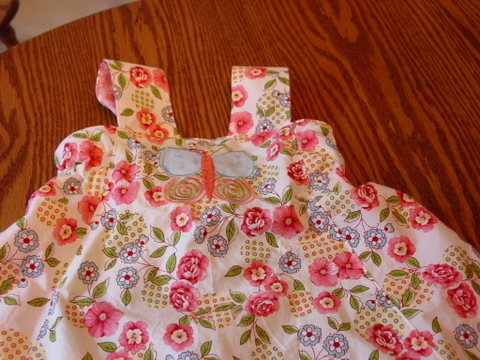 You will love making this dress and it’s not hard, either. I dont’ expect you’ll need help, but if you do, let me know and I’ll be glad to help. Love your choice of fabric. The colors are just beautiful. Have been intimidated by these patterns, but yours is so beautiful, I may just have to try it. Janice, please give it a try. You will be surprised how easy these patterns are. The only thing that’s different is that you have to trace the patterns and add a seam allowance. But the basic construction is usually pretty straight forward. – Let me know if I can be of any help. I have done a few of Farbenmix’ and Ottobre’s patterns and just love them. – Thanks for commenting and stopping by.